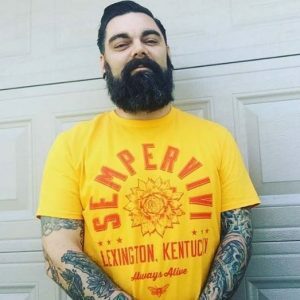 Just as with the T-shirt design for my previous band Analog Apostles, the first Sempervivi shirt design has been a big seller out of the gate. Releasing and promoting an album is a lot of work, but I never slack off when it comes to the accompanying merch. Therefore, I put in some serious time on the minutia of this apparel project. Since I was spending my own money to print these, and I wanted fans to actually buy them, every detail counted. My buddy Jeremiah modeling the design. Shirt art was not originally in the plans or budget after finishing the record. However, my wife liked the idea and encouraged me to splurge, within reason. I felt like there were enough black and heather grey band shirts in the world. I needed my shirt art to stand out. My music is, generally speaking, positive and upbeat, so bright yellow seemed like a good choice. You can’t go wrong pairing it with red ink. The primary colors pop sitting on the merch table! Keeping the art at one ink color offset the cost of springing for super soft, vintage tees. I wanted to go for a sports feel with the layout, similar to designs by Roots of Fight. 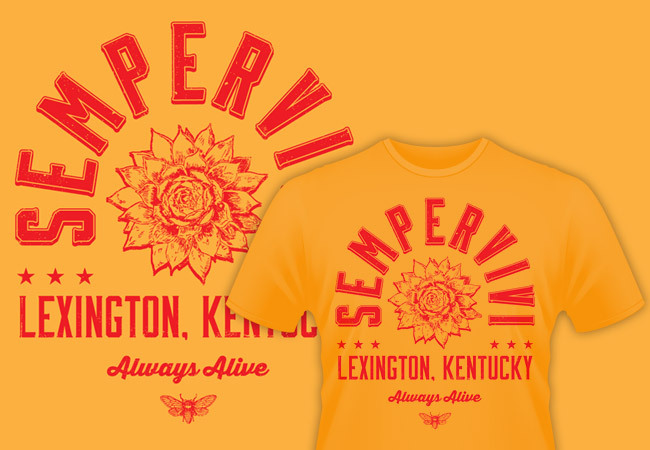 The arching “SEMPERVIVI”, as well as “LEXINGTON, KENTUCKY” are set in the tall title font Moonshiner. I mixed it with the bold, trendy script Thirsty, which spells “Always Alive”. Since this is a promotional item tying in with the new record, I reused some hand drawn elements from the CD art. Specifically, I made the succulent the focal point of the art. The much smaller cicada at the bottom punctuates the composition. Finally, I used a grunge brush to create a distressed feel throughout the artwork. If you have a band or other music project, I’ve got your hookup for apparel design. I will work with you on a budget friendly design that will still stand out. Contact me to get started! Plumpy'nut is a peanut butter based food used to fight malnutrition in famine stricken countries. A single pack contains 500 calories, can be stored unrefrigerated for 2 years, and requires no cooking or preparation.